Do you know what those things [smoke alarms] on your ceiling really do? 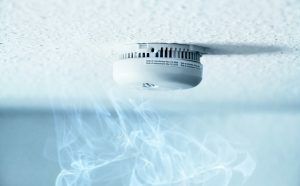 For many of us smoke alarms aren’t something we think about until the battery goes dead and we are jarred back to the reality of their presence by the annoying beeeep! that pierces our ear drums. We may be getting ready for work in the beeeep! morning or getting ready for bed when beeeep! we’re reminded that we need to add a 9 volt battery to our shopping list. If you’ve ever been tempted to shut the door to the basement, pull the battery out or otherwise disable your fire alarm – DON’T! That pesky little gadget can save your life! According to the NFPA’s (National Fire Protection Association) Smoke Alarms in U.S. Home Fires report, in home structure fires when there were deaths involved, 38% of those fires had no smoke alarm present. The report goes on to state that the death rate was more than twice as high in homes that didn’t have working fire alarms. The NFPA’s report summarized that when smoke alarms were present but did not operate it was due to missing or disconnected batteries 46% of the time. In smoke alarm failures, 24% were due to dead batteries. Property damage and even death can be avoided by simply allowing the gadgets we already have in our homes to work! That means replacing the batteries and making sure we don’t ignore that beeeep! They were designed to be annoyingly high-pitched for a reason – for our safety. Go buy a couple of 9 volt batteries (or whatever your particular smoke alarm utilizes) to keep on hand so when it’s ready to be replaced you can do it at the fir – beeeep! –, at the first warning sound you hear.